Under the Table was founded in 2001 in Brooklyn, NY by Matt Chapman and Liz Turkel (PTP '01 grads). Our company is dedicated to creating original, hilarious, relevant, and accessible physical theatre. Our work is fueled by a commitment to the collaborative process of the ensemble. We have created eleven full-length productions, performing and teaching around the world. Since 2007, we have operated as a trio made up of Matt Chapman, Sarah Petersiel (PTP '03) and Josh Matthews (PTP '00). The company's work has spanned a broad range of forms, mostly comedic - from commedia-inspired political and social satire; to red-nose clown shows and noses-off physical comedies; to high-tech, immersive theatre for young audiences. Our relationship to Dell'Arte International has been strong since the company's founding. Many of the folks who have collaborated with us in the past thirteen years have been Dell'Arte graduates – among them Greg Maupin, Jamie Lachman, Amanda Haney, M. Graham Smith (all '01), Tony Fuemmeler ('03), Tine Host ('96) and Molly Armstrong ('09). Over the years we've returned to Blue Lake bringing five different shows to the Carlo, including as part of the former EdgeFest. Ronlin Foreman (DAI School Director) worked as an artistic consultant on both SOLO: a two-person show and The Hunchbacks of Notre Dame. Both Ronlin and Joan Schirle (Founding Artistic Director) worked with us before our West Coast tour of The Only Friends We Have. The relationship deepened in 2009 when Matt Chapman was selected with Joan and Ronlin as a recipient of Theatre Communications Group's New Generations Future Leaders program. Living in Blue Lake, and eventually working on faculty, Matt's proximity to the school kept Under the Table close to the organization. In 2010, Sarah and Josh joined Matt for a two month period to devise The Hunchbacks of Notre Dame in residence at Dell'Arte. We've put an emphasis on touring since the beginning. It made sense for us to get on the road to help shows find legs - while we couldn't afford a month-long run in NYC, we could sustain two shows apiece in seven cities. La Famiglia has been a huge assistance in this regard as well- from Louisville to Seattle, D'A connections (shout out to Michael Fields) have been essential in helping us set up gigs. We've played in black boxes, large presenting houses, dance studios, parks, coffee shops, a senior center transformed into a Fringe venue, universities, bars, a hallway at an anti-war teach-in, performing arts schools, festivals, cultural centers, a museum, and behind a curtain by the credit card machine in a Denver restaurant. We've performed in 11 US States, 4 Canadian Provinces, Mexico, Colombia, and created two shows for young audiences in residence in Denmark. This range of venue and geography is, for us, a manifestation of our interest in learning from a broad audience base how to make our comedy pop as well as connecting through live performance with people at home and beyond. 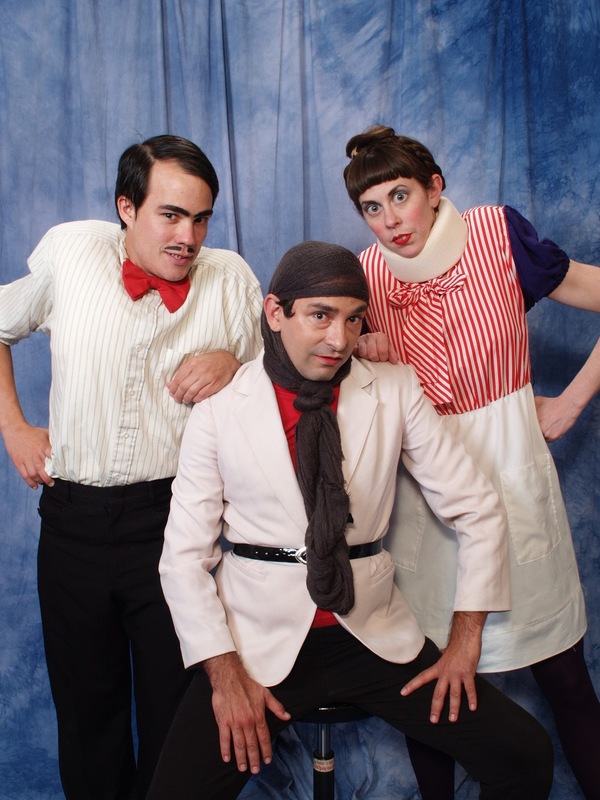 Matt Chapman, Sarah Petersiel and Josh Matthews (front) as The Huchinson Family Players from Under the Table's current touring show The Hunchbacks of Notre Dame.